Playable in 2D and 3D. Box Text: WHO WANTS TO PLAY VIDEO GAMES? - Journey through the land of Ooo and find perilous dungeons, radical treasure, and monsters to punch in a quest of never-ending fun! 11-18-2017 silverbow Name Adventure Time: Hey Ice King! Why'd You Steal Our Garbage?!! 11-14-2017 silverbow Description Packaging text in English, French & Spanish. Playable in 2D and 3D. Also on the DS. 11-11-2013 busybee Description Playable in 2D and 3D. Also on the DS. 11-11-2013 busybee Box Text WHO WANTS TO PLAY VIDEO GAMES? - Journey through the land of Ooo and find perilous dungeons, radical treasure, and monsters to punch in a quest of never-ending fun! 11-11-2013 busybee Name Adventure Time: Hey Ice King! Why'd You Steal Our Garbage?! 12-26-2012 disgaeniac Description Playable in 2D and 3D. Also on the DS. 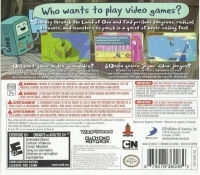 This is a list of VGCollect users who have Adventure Time: Hey Ice King! Why'd You Steal Our Garbage?!! in their Collection. This is a list of VGCollect users who have Adventure Time: Hey Ice King! Why'd You Steal Our Garbage?!! in their Sell List. 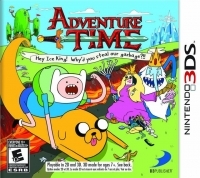 This is a list of VGCollect users who have Adventure Time: Hey Ice King! Why'd You Steal Our Garbage?!! in their Wish List.